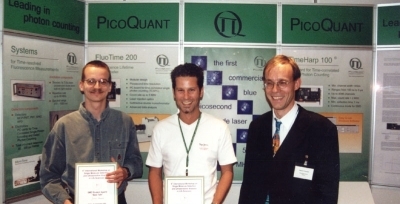 Since 1999 PicoQuant GmbH awards a “Student Award” at the annual workshop on “Single Molecule Spectroscopy and Ultra Sensitive Analysis in the Life Sciences”. Undergraduate and graduate students are encouraged to participate in this best presentation competition which offers a cash award worth 1000 Euro. The award is aiming to encourage young scientists to present their work in a broader audience. Undergraduate and graduate students can now submit their abstract for the “Best Student Talk” to be awarded at the 25th anniversary workshop on “Single Molecule Spectroscopy and Ultra Sensitive Analysis in the Life Sciences”. 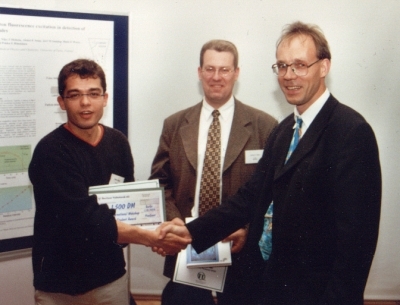 The competition for the best presentation offers a cash award worth 1000 Euro. As the quality of the students talks this year proved again to be excellent, it was impossible to nominate only one, but two winners. 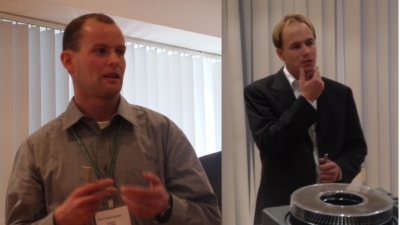 The prize with a value of 750 Euro was split between André Dathe (Jena University Hospital, Germany) who gave a talk on “Single-molecule FRET analysis of enzyme conformations and diffusion of nanostructures in a confocal ABELtrap” and Johan Tornmalm (KTH Royal Institute of Technology, Sweden) who presented his work on “Transient State Monitoring of Cellular Autofluorescence”. We would like to thank all participating students for presenting such excellent talks and to congratulate the winners. 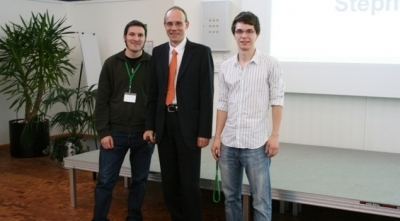 This year’s student award with a value of 750 Euro went to Klaus Yserentant (University of Heidelberg, Germany) for his excellent presentation on “measuring the absolute degree of labeling for protein tag-based labeling in quantitative fluorescence microscopy”. Congratulations! The student contributions from this year were all of excellent quality, making the jury's job to select a winner a very difficult yet enjoyable task. 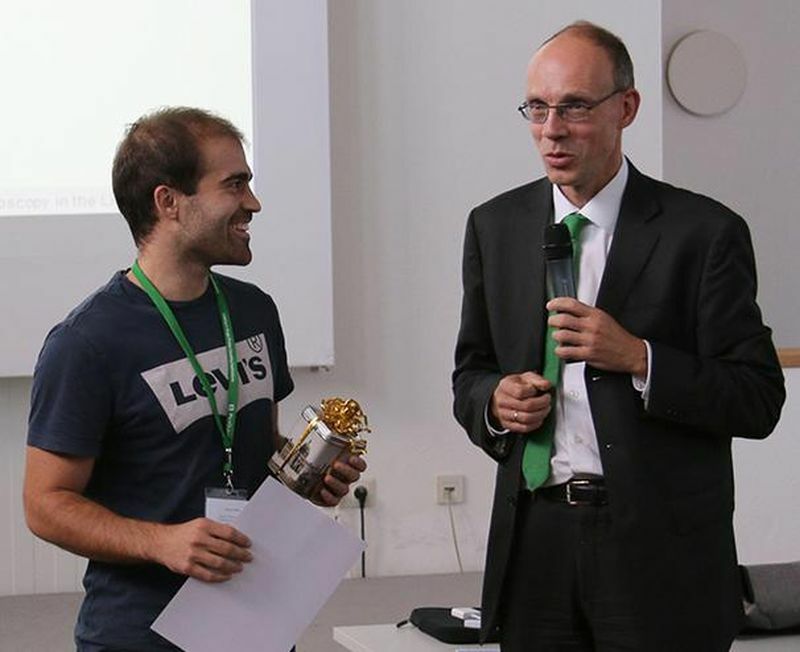 The student award of 750 Euro went to Falk Scheider (University of Oxford, United Kingdom) who presented his research on “lipid and protein diffusion in actin-free plasma membrane vesicles”. As expected from the previous years, the trend for excellent contributions continued and made it very difficult for the jury to nominate a single winner. 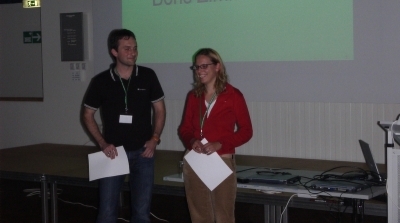 So this years student award of 750 Euro was split between Anne Plochowietz (University of Oxford) who presented her work on “mobility and spatial distribution of transfer RNA (tRNA) in live bacteria using single-molecule tracking” and Sinan Kilic (École Polytechnique Fédérale de Lausanne) who talked on how “multivalency and local competition of heterchromatin protein 1 governs dynamic protein turnover in stable heterochromatin domains”. 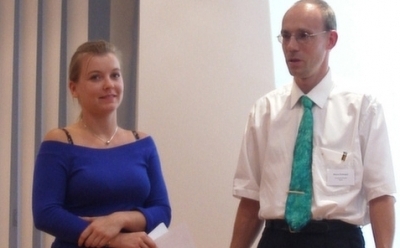 In 2014, the student award was given to Weixing Li from the Georg August University Goettingen. Li's talk on “Cryo-Fluorescence Microscopy of Single Molecules” was considered a groundbreaking new approach by the jury. As expected from the previous years it proved extremely difficult for the jury to nominate the winner, since there were so many good contributions. In the end the price of 750 Euro was awarded to David Bauer (University of Oxford) who gave a talk on “Nanofluidics to Enhance Single Molecule DNA Imaging: Detecting Genomic Structural Variation in Humans”. As the quality of the students talks proved again to be excellent, it was impossible to nominate only one, but three winners. The prize was increased to 900 Euro and split between Sigrid Milles (EMBL Heidelberg, Germany) who gave a talk on “Nup153 in nuclear transport - plasticity of a highly flexible nucleoporin”, Stefan Geissbühler (EPFL Lausanne, Switzerland) who spoke about “Balanced Super-resolution Optical Fluctuation Imaging” and Bengt Wunderlich (University of Zürich, Switzerland) who presented his work on “Microfluidic Mixing and Sorting for Single Molecule Detection”. Again this year it proved extremely difficult for the jury to nominate the winner, since there were so many good contributions. In the end the price was split between Kerstin Weiss (University of Göttingen) who gave a talk on “Quantifying the Diffusion of Membrane Proteins and Peptides in Lipid Bilayers” and Justin Pinkney (University of Oxford) for his presentation on “Single-molecule fluorescence studies of site-specific DNA recombination”. As expected from the previous years it proved extremely difficult for the jury to nominate the winner, since there were so many good contributions. 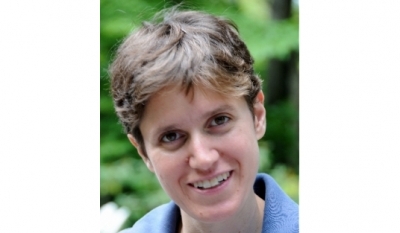 In the end the price was awarded to Lisa Marshall (MIT, Cambridge, USA) who gave a talk on “Extending single-molecule spectroscopy to nanosecond through millisecond time scales”. As the quality of the students talks proved again to be excellent, it was impossible to nominate only one winner. The price therefore had to be split between Sebastian van de Linde (University of Bielefeld, Germany) who gave a talk on “A General Concept for Super-Resolution Fluorescence Microscopy” and Stephan Uphoff (University of Oxford, UK) who presented his work on “Measuring multiple distances within a single molecule using photoswitchable FRET acceptors”. 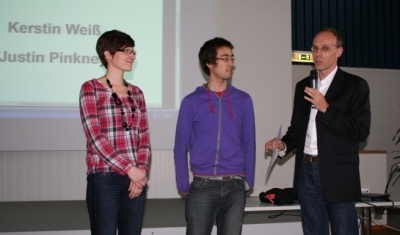 Both students received 500 Euros. As expected from the previous years it proved extremely difficult for the jury to nominate the winner, since there were so many good contributions. 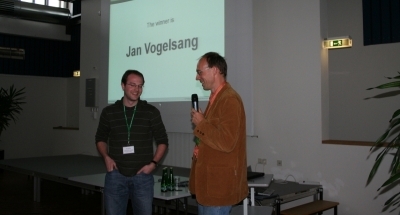 In the end the price was awarded to Jan Vogelsang (LMU München) who gave a talk on “Control of Fluorescence Characteristics by Photoinduced Redox Reactions”. The winner of this year's contest was Benoit Muls from Université catholique de Louvain in Belgium. His talk was entitled “Unravelling energy transfer pathways in conjugated polymers by defocused wide-field microscopy”. Again this year it proved extremely difficult for the jury to nominate the winner, since there were so many good contributions. 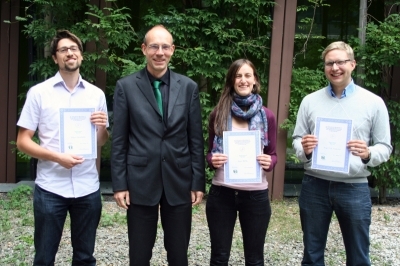 In the end the price was split between Barbara K. Müller (LMU München) who gave a talk on “Determination of FRET-Efficiencies using PIE-FCCS” and Boris Zimmermann (Universität Freiburg) who gave a talk on “Movements of the ε-subunit during catalysis in single membrane.bound H+-ATPsynthase revealed by fluorescence resonance energy transfer”. 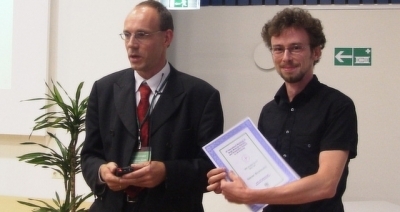 This years price was awarded to Xavier Brokmann from the Laboratoire Kastler Brossel, Paris in France, with an excellent talk on “Exploring the atomic-like fluorescence properties of single CdSe nanocrystals”. 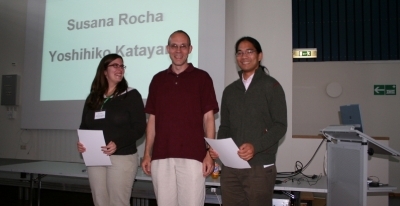 As this was actually his first conference on single molecule spectroscopy, he promised to be back for the 11th workshop in 2005. Again this year it proved extremely difficult for the jury to nominate the winner, since there were so many good contributions. In the end the price winner Sandra de Keijzer from the University of Leiden in the Netherlands, with an excellent talk on imaging of individual G-protein coupled receptors on the plasma membrane in vivo. As the quality of the students talks proved again to be excellent, it was impossible to nominate only one, but two winners. So in the end the price was split in between Manuel Diez (Freiburg), who presented a talk on Monitoring Γ-Subunit Rotation in Single EF0F1-H+ -ATP Synthase during ATP-Synthesis by Fluorescence Resonance Energy Transfer” and Katrin Heinze (Göttingen) for her talk on “Advanced Concepts and Applications of Cross-correlation Analysis Probing Complex Interactions of Biomolecules within their Native Environment”. It proved extremely difficult for the jury to nominate the winner, since there were so many good contributions. So in the end the price was split in two between Phillip Tinnefeld (Heidelberg) for his presentation on “Multidimensional Signal Processing in Single Molecule Spectroscopy: A Reliable Tool to Study Multichromophore Systems” and Enno Schweinberger (Gottingen), who spoke about “Single Molecule FRET Dynamics Reveals an Equilibrium between a Closed and an Open Conformation of Syntaxin”. 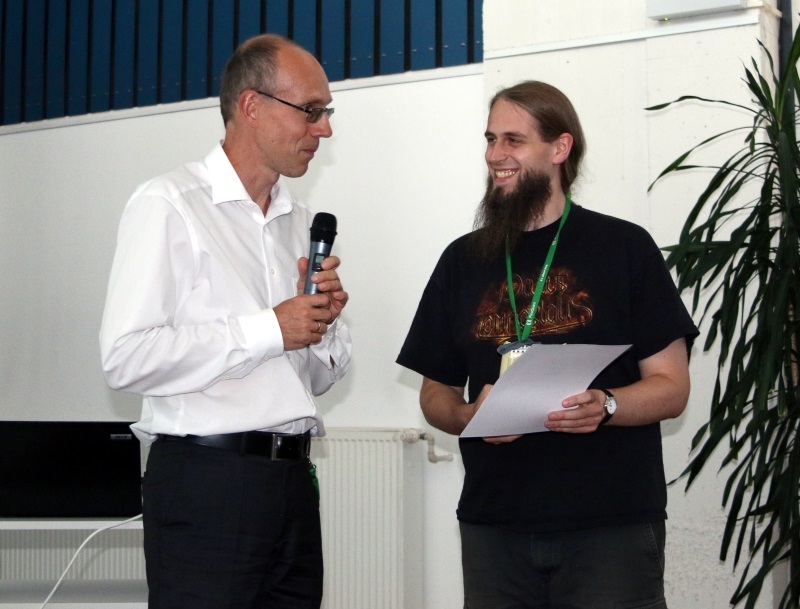 The winner was Jonas Korlach (left in picture) with the talk “A new strategy for sequencing individual molecules of DNA”. The winner was Cedric Begon from the Laboratoire d'Optique des Surfaces et des Couches Minces (LOSCM), Marseille, together with his coworker H. Rigneault, who presented an excellent talk on Spontaneous Emission Control and Detection of Biological Markers. 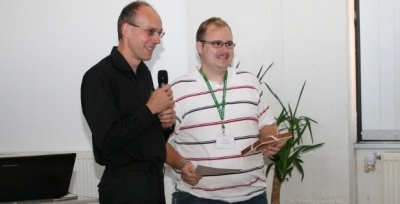 A book price for the best poster was awarded to Juhani T. Soini from Finland.